3 bedrooms, 6-8 people, 2 fireplaces, sauna, whirlpool, lots of space! This holiday home with lots charm offers the most possible comfort on 130 m2 thanks to the spacious, open construction - renovated & furnished in July 2010 (that is why there are no winter photos). Ideal for families with children, because hardly any traffic, lots of animals in the village, kiddie pool + children's furniture & toys available. Enjoy a romantic bath by candlelight in the whirlpool! Large living/dining room on the ground floor. The wood-dining table can be pulled out & is ideal for up to 8 people. It is particularly cosy when the fire is burning in the oven or fireplace (firewood available). The village of Stierva has 180 residents (Rhaeto Romanic & German is spoken) & is somewhat far from the large tourism centres & their stress. In the forest, not far from the house, you will find a playground for children & a ski lift for them as well. Skiing in Savognin (10 km from Stierva): 80 slope km for all levels! 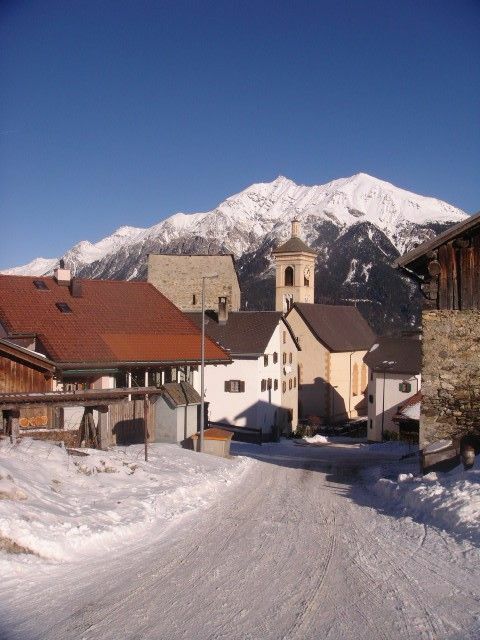 The ski region of Savognin is on a transit route in the heart of the Tales Surses or between Tiefencastel and Julier/Septimerpass in beautiful Graubünden. 13700 ski and snowboard lovers can be transported up the mountain per hour through 7 lifts and 3 cable cars. The chair lifts come from 3 sections of the valley (1200 m) up to the 2670 m high Piz Martegnas. This is really a great ski mountain. From the summit, you can have a stunning view of the skiing area under the Piz Cartas (2713 m). Altogether, the region has 80 slope km, from which 10 km are difficult, 37 km are medium and 33 km are easy. The ski region can be reached by car in about 15 min (through Mon or Tiefencastel). Skiing in Lenzerheide: Powder snow and sunshine are not rare! The Lenzerheide ski region is an upper valley, embedded between the mountain chains of Stätzerhorn and the Piz Scalottas. It is a passage - on its north-south axis are the cities of Parpan, Valbella and Lenzerheide. On the east and west side of this axis are the descents of the ski region. The valley is at approx. 1500m above sea level, the only summit can be reached just under 3000 m (Rothorn 2980m, Stätzerhorn 2575m). It is possible to enter the winter sport region at multiple points. By sunshine (not rare here!) it is worth beginning on the west side in the morning, so between Stätzerhorn and the Piz Scalottas, in order to enjoy the early sun. Altogether, the region has 155 slope km, from which 19 km are difficult, 64 km are medium and 72 km are easy. Altogether 39 lifts transport the skiers and snowboarders uphill. In addition to the large bathroom on the 1st floor with a large bathtub where 4 adults can fit at once + an extra large shower - there is a cosy sauna for up to 4 people. This is great on cooler summer/fall evenings and during the winter after a day on the slopes or while snowshoeing. On the ground floor next to the dining room you will find a guest toilet. A big wooden table, 8 comfortable chairs + 1 babychair + 1 child-chair. The house has it all, good beds, a fireplace to heat when needed, sauna, whirlpool and a beautiful view. The kitchen is sufficient and has it all, fondue and raclette is to add to the usually kitchen supply. Get some local cheese for your fondue or raclette! If you want to go for a walk or a hike, choose of the many routes and explore the locals and the scenery. The locals are super friendly and have a word with you (if you speak german or some swiss german). Great place to be and take a break from everyday life. Nicht zum ersten Mal verbrachten wir eine wundervolle Zeit in diesem gut ausgestatteten Haus in Graubünden. Obwohl es in der ersten Woche noch an Schnee mangelte, gab es sowohl ausserhalb des Hauses (Grillplätze, Wanderwege...) als auch innerhalb des Hauses (Sauna, Whirlpool...) viele Möglichkeiten, sich wunderbar zu beschäftigen. Als es geschneit hatte, waren umliegende Skigebiete schnell zu erreichen. Als krönender Abschluss des Urlaubs gab es noch Capuns im örtlichen Restaurant. Wir waren bestimmt nicht das letzte Mal in Stierva und freuen uns jetzt schon aufs Wiederkommen! We came for 1 week to spend holidays in this house. 2families with 4 children (age 4-6yrs). We had wonderful time there. However the weather was a bit rainy, we did nice trips everyday. All the recommendations from the owner were really helpful. Stierva and the neighborhood are lovely, we enjoyed all the little walks through the small old villages around. Tasted cheese or ice-cream from the local shops. We visited also Bad Alvanaz, museum of trains in Bergün and St. Moritz, Katrin's Hütte, the little waterfall and lot of other places. The house is perfect for relax, save for children, is practically furnished / equipped and has really wonderful atmosphere. Thank you for unforgettable vacations! We were two families travelling together through Europe (from Australia) and this was our highlight. After all the millions of tourists in Venice and Paris it was lovely to escape to the countryside! The house was perfect and easily fit us all in. We went for long walks and met the lovely locals. The 8 hour drive from Venice was worth it!!! We flew out of Milan which was only a 4 hour drive - Zurich is even closer. If you want a real Swiss experience this is the place for you. We visited Stierva in September. It is a tiny and beautiful village with local shop where you can buy everything that you need and great restaurant serving delicious Capuns. House is beautiful. It has spacious and comfortable rooms, sauna, Jacuzzi and terrace with breathtaking view that will last in our memory for a very long time. The nearby area is great for walking, hiking and biking. Both mountain bikers and road bikers will find appropriate tracks for them. And they are beautiful! Villages like Mutten and Obermutten ale breathtaking! And you can get there quite easily with local paths. Attraction that cannot be missed is train ride from Tiefencastel to St. Moritz. This route is on the UNESCO World Heritage list. We stayed in Stierva only for one week but we left Switzerland completely relaxed. We didn’t have time to explore everything in the local area, but we will definitely come back. Maybe in winter, with snowboards instead of bikes. The house is located approx. 1350 m above sea level in a sunny & peaceful location on the lower edge of the village of Stierva (Albulatal)- approx. 10 or 15 km from the famous ski regions of Savognin (80 slope km) and Lenzerheide (155 slope km). Stierva is a part of the ELA - the largest nature park in Switzerland (more than 1000 km of marked hiking paths). The small streets that lead from Savognin through Mon or from Tiefencastel to Mon end shortly behind our house. Absolute tranquillity and a great mountain panorama await you! Clear mountain air, crystal-clear lakes and streams nearby, signs of Rhaeto-Romanic culture. Hiking & cycling routes begin directly next to the house. In the village of Stierva, there is a small supermarket, post office and a family-run restaurant where the best Capuns ('mangold wrap') in Graubünden are served. Swimming: year-round in the wellness centre in Bad Alvaneu, sulphurous warm brine (15 minute drive); in the summer in the reservoir lake Lenzerheide. Im Preis ist Strom, Wasser, Heizung, Saunanutzung und die Marken für die Müllentsorgung enthalten. Der Preis gilt für eine max.Belegung von 6 Personen ab 12 Jahre. Jede weitere Person ab 12J zahlt 10 EUR/pro Nacht. Da wir nicht vor Ort wohnen ist eine Banküberweisung des kompletten Preises VOR DER ANREISE in CHF oder Euro gewünscht. Endreinigung beträgt 150 CHF zahlbar mit der Mietzahlung.